I’m rather obsessed with wallpaper and the idea that I may someday have the space to wallpaper part of. It’s a big investment ($ and time) so you need to be sure you love it and can live with it a long while, unlike paint colors that can be changed every few years. I’ve posted before about wallpapers I love. I have an obsession with light as well. I’m always posting about it. So to find a wallpaper that emits light is like hitting the jackpot. I love this wallpaper! well I think I’ve hit a road block on day 34’s drawing. Something is not working for me about it. Any feedback would be so appreciated…here’s the work in progress. 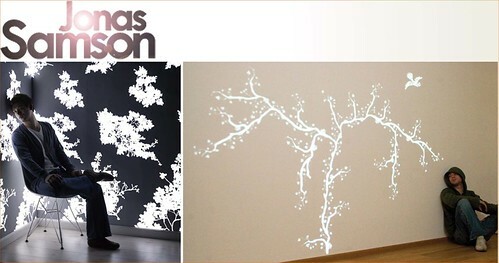 2 Responses to Jonas Samson: Light emitting wallpaper. hey thanks Jen! How fun. Nice blog by the way, I’m going to have to explore it more later after reading your random facts! Should be fun to complete. I’ll try to get it done tonight.